The accurate identification of fruit flies is a key component of Australia’s biosecurity system that underpins the domestic movement of fruit and vegetables, maintains international market access for Australian producers and protects Australia’s borders from exotic pest incursions. This completely revised version of The Australian Handbook for the Identification of Fruit Flies has been compiled by diagnosticians for diagnosticians using some of the latest research outcomes and resources available. The handbook is a compilation of diagnostic information for 65 fruit fly species, most of which are exotic to Australia, including the non-tephritid fruit infesting Drosophila suzukii (spotted wing Drosophila). It is intended to facilitate rapid diagnosis of fruit fly species and be a comprehensive guide for Australian diagnosticians and field officers involved in maintaining, supporting and enhancing Australia’s biosecurity system. The handbook draws together hundreds of new high definition fruit fly images as well as new molecular diagnostic tools generated from this research. 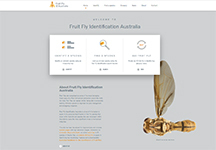 A companion website Fruit Fly Identification Australia has also been developed. The website contains an expanded selection of high definition images as well as an updated description of the latest molecular techniques and protocols used for the identification of fruit flies. The website also includes a new multi-entry lucid key for identifying the Dacini species as well as comprehensive printable data sheets and an interactive glossary. The handbook and website were developed to support Australia’s fruit fly researchers, academics, surveillance officers, diagnosticians and laboratory scientists with the hope that the sharing of information and experience, as well as the constructive communication that brings this knowledge base together, will continue to grow. Further information on the handbook is available from admin@phau.com.au, Plant Health Australia. 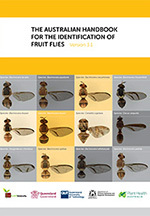 This publication and the website Fruit Fly ID Australia are the product of the Plant Biosecurity Cooperative Research Centre (PBCRC) project Next Generation National Fruit Fly Diagnostics and Handbook PBCRC2147.